Long before he was sacking quarterbacks, Tamba Hali was facing bigger challenges. Learn about his life in this second book in a brand-new nonfiction series about the childhoods of your favorite athletes. Kansas City Chiefs linebacker Tamba Hali’s story seems almost unbelievable. He and his seven siblings fled war-torn Liberia to the Ivory Coast during his youth and later joined their father, a chemistry and physics professor, in New Jersey. There Tamba played both basketball and soccer, but he didn’t discover football until a coach finally persuaded him to try out in high school. And the rest, as they say, was history. Tamba discovered that he had a real talent for it, landing him an athletic scholarship to Pennsylvania State University and a coveted spot on their football team. 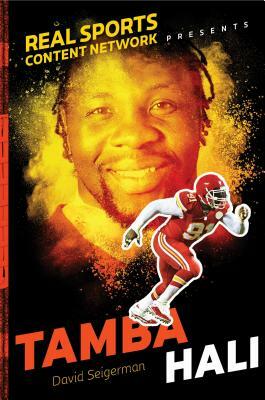 Tamba went on to play in the NFL and finally brought his mother to the US from Liberia. His drive, dedication, and athletic ability are inspiring. David Seigerman is a veteran sports journalist whose writing career began in newspapers (Newsday, The Jackson Sun) and moved on to magazines (College Sports Magazine). In 1996, he moved from print to broadcast media, becoming a field producer for CNN/SI and later the managing editor at College Sports Television. Since 2003, he has been a freelance writer and producer, and in late 2016, he cofounded HowFarWouldYouGo.org. He lives in Westchester County, New York, with his family.